New Delhi : The Chief Minister of Himachal Pradesh, Virbhadra Singh, today called on the Prime Minister Narendra Modi, in New Delhi and discussed various pending issues of State interest with him. Virbhadra Singh categorically raised the issue of four laning of Mandi-Pathankot National Highway No-154 (Old No.20) with Prime Minister and apprised him that this road was important from defence point of view and one of the important routes to ensure military supplies to defence personal deployed in Leh and other border areas of the country. He urged that there was a need for intervention in this matter so that the Ministry of Road Transport and Highways could take up the construction work on this road on priority basis. The Chief Minister also urged the Prime Minister that the funds under Flood Management Programme for Swan River and Chhounch Khad in Una District, which was Rs.224.35 crore and Rs.11.10 crore respectively, may be released on priority basis. The reimbursement claims against the expenditure incurred by the State Government have already been filed with the Ministry of Water Resources, he apprised. 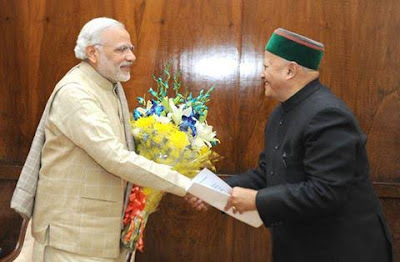 Discussing the issue of tourism potential and importance of better connectivity in the State, Virbhadra Singh apprised the Prime Minister that the Ministry of Civil Aviation, around three years ago had abruptly discontinued the commercial Flights to Shimla Airport and said that there was a need to issue direction to ensure resumption of commercial flights so that the tourists keen to visit Queen of Hills-Shimla could get better connectivity. Virbhadra Singh also raised the issue of release of funds under MNREGA and apprised that since September, this year the State Government had not received any grant and there was about Rs.90 Crore wage liability pending with the concern department, causing inconvenience to the poor people and embarrassment to the State Government as well. The Chief Minister also discussed the issue of transfer of land near H P Vidhan Sabha belonging to Government of India to the State Government for construction of new State Library. He apprised that the request in this regard had already been made to the Ministry concern. Prime Minister narendra Modi assured the Chief Minister that the issues raised by him would be taken up on priority basis and no compromise would be made on developmental issues in any corner of the Country.